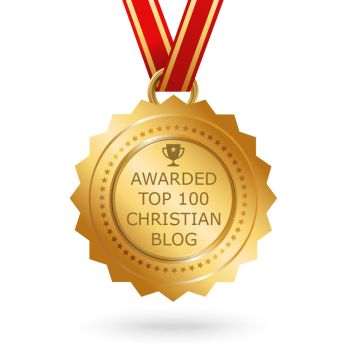 Although some people believe that the Ten Commandments were abolished with Christ’s sacrifice, it is not true. The full Decalogue may not be listed in the New Testament, but is alluded to in five places (Matt. 5:17-19; Mark 10:19; Luke 18:20; Rom. 7:7-8; 13:9; 1 Tim. 1:9-10),3 and Jesus even stated that it was not his job to do away with the law. Many Bible teachers and most all scholars say there are more commandments than just ten, and this is true. The Hebrew Torah contains 613 detailed commandments from God,5 but generally, everyone means just the major ones given to Moses on stone tablets at Mt. Sinai, when speaking about God’s commandments. 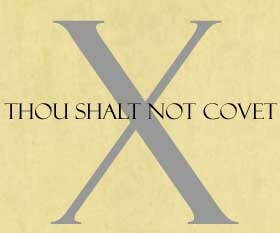 This study is about the tenth commandment—the last one. It is about “coveting” and a modern dictionary definition states covet as: (1) to wish for, (2) to inordinately desire what belongs to another.6 The biblical definition is pretty much the same, which is “desiring to possess something at the expense of the legitimate owner.”7 This word covet8 is translated as lust or strong desire in many Bible versions. “You shall not covet your neighbor’s house; you shall not covet your neighbor’s wife, or male or female slave, or ox, or donkey, or anything that belongs to your neighbor” (Exodus 20:17). 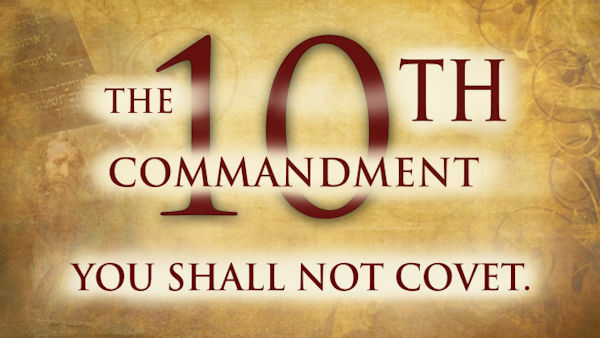 A common belief is that the Catholic Church changed the listing of the Ten Commandments by removing the commandment about “not worshiping idols” and divided the 10th commandment into two, so there would still be a total of ten. The Catholic Church, however, gives a different reason for the change. They justify the change by claiming the original texts did not have verse numbers and did not specify how they should be grouped. According to one Catholic writer, it was St. Augustine’s reasoning to divide the Decalogue this way and the church just continues to observe it.9 It should be noted here that the Lutheran Churches (but not the Reformed) and some few others, follow this same tradition. “Unlike the other commandments which focus on outward actions, this commandment focuses on thought.” It is imperative not to set one’s desire on things that are forbidden. “One commandment forbids the act of adultery. This commandment forbids the desire for adultery. One commandment forbids stealing. This commandment forbids the desire for acquisition of another’s goods.”10 As an example, Jesus emphasized this fact when he said, “You have heard that it was said, ‘You shall not commit adultery.’ But I say to you that everyone who looks at a woman with lust has already committed adultery with her in his heart” (Matthew 5:27-28). 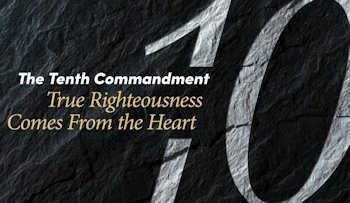 The tenth commandment (or the 9th and 10th for Catholics) forbids the desire of what another has “as the root of theft, robbery, and fraud, which the seventh commandment forbids.” It is a “lust of the eyes” and “summarizes all precepts of the Law.”15 A modern interpretation for today’s world comes from author Kelli Mahoney. “The tenth commandment asks us to look inside ourselves . . . [‘Want’] in itself is not wrong. We want food. We want to please God. We want love. Those things are good things to want. What is key to fulfilling this commandment is wanting the right things in the right way. Our possessions are temporal, they will only please us today, not for eternity. God reminds us that our wants should reflect our eternal life with Him. Although rarely used, in the New Testament covet17 can be applied as a commendable earnest desiring, such as a desire for the greater spiritual gifts (1 Corinthians 12:31; 14:1, 39).18 In these cases, one may greatly desire a beneficial attribute like that of another, but without actually wanting to take it away from, or doing any harm to, the other person. “For from within, out of the heart of man, come evil thoughts, sexual immorality, theft, murder, adultery, coveting, wickedness, deceit, sensuality, envy, slander, pride, foolishness. All these evil things come from within, and they defile a person.” (Mark 7:21–23, ESV). OBS respects your privacy and is compliant with accepted U.S. practices as well as European Union GDPR regulations. Decalogue: Greek: deca + logos (ten words). Singer, Isidore, (ed. ), The Jewish Encyclopedia: A Descriptive Record of the History, Religion, Literature, and Customs of the Jewish People from the Earliest Times to the Present Day, 12 Volumes, (New York; London: Funk & Wagnalls, 1901–1906), p. 492. Easton, M. G., Easton’s Bible Dictionary, (New York: Harper & Brothers, 1893). Merriam-Webster’s Collegiate Dictionary, (Springfield, MA: Merriam-Webster, Inc., 2003). Manser, Martin H., Dictionary of Bible Themes: The Accessible and Comprehensive Tool for Topical Studies, (London: Martin Manser, 2009), listing #6133. Strong’s Hebrew #2530. חָמַד châmad; a prim. root; to delight in: greatly beloved, covet, delectable thing, (× great) delight, desire, goodly, lust, (be) pleasant (thing), precious (thing). Luther, Martin, The Large Catechism, (translated by F. Bente and W. H. T. Dau, Triglot Concordia: The Symbolical Books of the Evangelical Lutheran Church), (St. Louis: Concordia Publishing House, 1921), pp. 565-773. Henry, Matthew, Matthew Henry’s Commentary on the Whole Bible, (Peabody, MA: Hendrickson Publishers, 1991), vol. 1, p. 286. Deere, Jack S., “Deuteronomy,” in The Bible Knowledge Commentary: An Exposition of the Scriptures, (ed.) J. F. Walvoord and R. B. Zuck, (Wheaton, IL: Victor Books, 1985), vol. 1, p. 273. Strong’s Greek #2206. ζηλόω zēlŏō, or ζηλεύω zēlĕuō; from 2205; covet (earnestly), (have) desire, (move with) envy, be jealous over, (be) zealous (-ly affect). Manser, Martin H., “Coveting as a commendable earnest desiring,” Dictionary of Bible Themes: The Accessible and Comprehensive Tool for Topical Studies, (London: Martin Manser, 2009). Knowles, Andrew, (ed. ), The Bible Guide, [1st Augsburg Books], (Minneapolis, MN: Augsburg Fortress, 2001), p. 586.